Tree pruning shears are used to cut and prune larger trees with thicker branches that hand shears simply can’t manage. 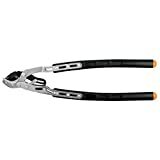 They provide the same function as hand shears, however they’re made from thicker steel and are more heavy duty in order to handle bigger branches. They also have longer handles allowing you to reach higher branches, but more importantly the longer handles are designed to give you more leverage to make cutting easier. Tree pruning shears are also often referred to as loppers and there are two main types. “Bypass Loppers” and “Anvil Loppers”. Anvil Loppers have an upper blade that closes onto a bottom flat “anvil” so it’s the top blade that actually makes the cut. These are primarily used for cutting back deadwood and branches and “preparatory cuts”, cuts that occur before a final cut is made with bypass loppers. Bypass loppers have a top blade the sweeps past the lower jaw to give a cleaner cut, as the cut is made using both jaws. These are used where the health of the plant your pruning matters, as they give a cleaner final cut reducing the chances that any diseases can take hold. As such Anvil loppers can be used to remove all older (and usually tougher) dead wood from a tree, and bypass loppers are used to prune back green growth and other living material. Fiskars PowerGear Lopper’s are extremely popular with more than 80% of customers rating them 5 out of 5 stars. These Bypass Loppers are 32 inches in length and are made from fully hardened steel. They have a cutting capacity up to 2 inches in diameter and the sharp precision ground blades have a corrosion resistant non-stick coating to reduce friction and make cutting & cleaning after use easier. One standout feature about these loppers is their patented “PowerGear” technology which helps to increase leverage and make cutting easier than traditional single pivot loppers. They claim to give you up to three times more power on every cut, without having to increase the amount of strength required to use them. This has been backed up based on “ease of use” feedback from gardeners that have purchased and are using these for their tree pruning. 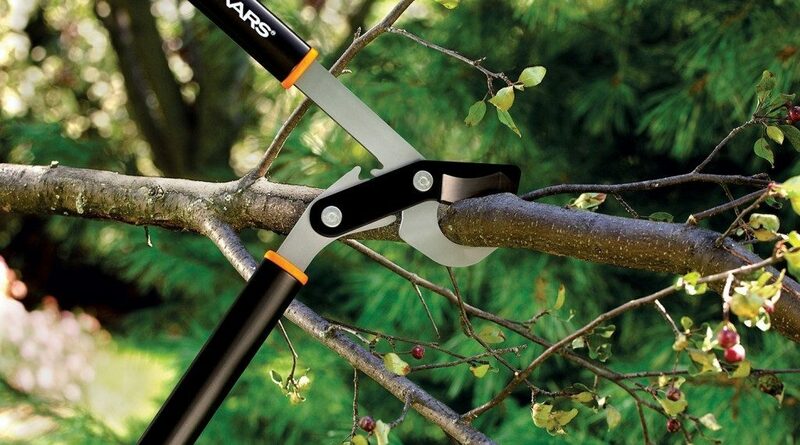 Fiskars Ratchet Drive Anvil Lopper are specifically designed to cut tough thick tree branches with their built in ratchet mechanism. This allows you to compound the force of the cut with each squeeze of the handles, powering a cut through extremely thick tough branches and deadwood. 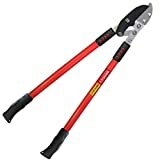 #3 TABOR TOOLS GG12 Compound Action Anvil Lopper, Chops Thick Branches with Ease, 2-Inch Cutting Capacity, 30-Inch Tree Trimmer with Sturdy Professional Extra Leverage 22-Inch Handles. The TABOR TOOLS GG12 Compound Action Anvil Lopper comes in at 30 inches in length and has a 2 inch cutting capacity. The blade is made from hardened carbon steel to ensure it retains it’s sharpness even after heavy use. It also has a low fiction non-stick coating to make cutting and cleaning after use much easier. It also has replacement cutting blades available so you don’t have to replace the entire tool should you require newer blades in the future. 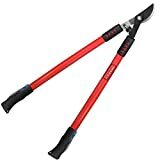 These loppers also have a compound lever system that includes multiple pivot points which increases the amount of force applied to the blades to help power through extremely tough branches. The handles are also made from painted steel ensuring they’re extremely sturdy. They also have rubberized grip handles for comfortable use and excellent grip. #4 TABOR TOOLS GL16 Classic Bypass Lopper, Makes Clean Professional Cuts, 1.25-Inch Cutting Capacity, 28-Inch Tree Trimmer and Branch Cutter Featuring Sturdy Extra Leverage 22-Inch Handles. TABOR TOOLS GL16 Classic Bypass Lopper, Makes Clean Professional Cuts, 1.25-Inch Cutting Capacity, 28-Inch Tree Trimmer and Branch Cutter Featuring Sturdy Extra Leverage 22-Inch Handles. POWER THROUGH 1.25" diameter thick branches with a quick chop and without struggle. This bypass lopper is designed for making fast and precise cuts that will preserve the health of your plants. 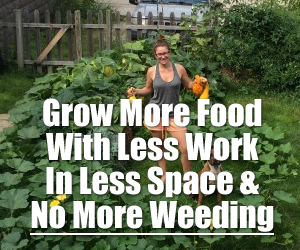 PRUNING MADE EASY! COMFORT GRIP WITH SHOCK GUARD. The rubberized grips on handles provide comfort and good grip. This longer 28" model will allow you the work with some extra strength and leverage and to efficiently navigate around tough limbs. The ergonomically 22-Inch handles are designed for optimal grip to ease the cutting of any branch. In addition, the shock-absorbing bumper stop all jarring vibrations and reduce arm and shoulder fatigue. SHARP AND STURDY. The fully hardened carbon steel blades will stay super sharp, even after some heavy use! Low-friction coated gliding blade can be re-sharpened which will prolong item's life! Overall, this is a lightweight and balanced tool which is easy to carry, even for the elderly gardener. EASY STORAGE: You can simply hang the lopper up side using the hole in the handles.This lopper will soon become YOUR BEST FRIEND IN THE GARDEN. ORDER WITH CONFIDENCE. The TABOR TOOLS customer satisfaction guarantee means exactly that. We will fix any problems quickly and answer to your need every time. We are always available to help our customers; our service record is unmatched! FREE GIFT: Order today, and get a wealth of pruning tips and tricks along with our follow up on your purchase. TABOR TOOLS Bypass Lopper’s are 22 inches in length and have a cutting capacity of 1.25 inches. They are made from fully hardened carbon steel and the blades have a low fiction non-stick coating to make cutting and cleaning after use much easier. The painted steel handles make them extremely robust and these also have rubber handles for greater comfort and extra grip.